It's about having the right mix of offshore scale and onshore domain knowledge... all nicely packaged in a suite of privately cloudy data centers that can be priced competitively for clients. So enter two candidates from separate continents which are experimenting with each other in a unique partnership to help clients modernize their applications and take advantage of both companies' core strengths: the cost-competitive offshore scale and expertise of HCL and the onshore domain expertise, legacy integration skills and data center resources of CSC. With the economy now in an upward swing and the relentless move to the cloud driving companies to overhaul their IT infrastructures faster than ever, HfS believes now is the time for ambitious providers to act aggressively in the market. Never before have so many organizations been plagued by so many integration nightmares created by multiple instances of ERP, legacy applications still surviving on spaghetti code workarounds, and islands of cloud apps being hurled into the throng, bringing a whole new set of integration challenges that most organizations are simply not equipped to tackle by themselves. Simply put, the rapid emergence of the cloud as is now creating an unprecedented demand for integration services - and the race is on among the leading IT services providers to take a lead in this evolving market. We view HCL and CSC’s partnership as being a bold and unique approach to developing a compelling offering to clients that takes advantage of each other’s respective market strengths. Both parties clearly feel they can close the gap on the market leaders more effectively by partnering than going it alone. For example, in banking, HfS estimates each company has roughly $200m in ADM revenues, which puts them well behind leaders such as IBM, Accenture and TCS. Both CSC and HCL need to do something to address this gap. The deal will entail co-creating a dedicated delivery network with the first centers located out of existing centers in Bangalore and Chennai. Though CSC brings extensive clients across the US government, the initiative will have an initial focus in banking and financial services, where both firms need to inject more firepower into their market presence and global capability. The two companies will each appoint a senior executive to run the joint operation encompassing a team of experienced employees sourced evenly from each firm, and the new entity will share revenues and costs based on predetermined rules around what is contributed by whom to each deal. The stated rationale behind the move is to allow them to move more quickly in their pursuit of the growing opportunity around modernizing legacy enterprise apps and solving the integration headaches being posed by multiple cloud and legacy applications. By combining respective strengths – such as CSC’s established client base in banking, where its Hogan platform creates a prime target and HCL’s skilled and lower cost offshore delivery teams, the two entities believe their collective opportunity will greatly exceed what each could obtain on their own. In the simplest terms, CSC gains access to HCL’s robust global delivery skillset and several new clients for its core technology platforms, especially outside of CSC’s public sector business. HCL will white-label CSC’s BizCloud as it standardizes and rationalized its private cloud offerings to two or three core infrastructure partners down from the 20 or so it has today. 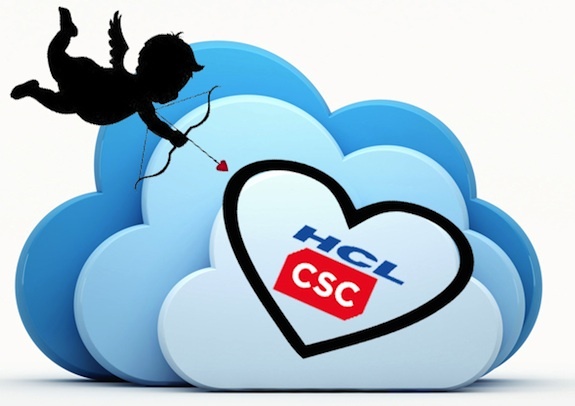 For its part, HCL will gain access to CSC clients to boost its enterprise application services business – a segment that was flat during 2013. These reasons alone are compelling and with each entity having mature leadership able to recognize the battles they cannot win on their own, the rationale is sound. Moreover, for several years now, CSC has needed to develop more robust offshore delivery capabilities to compete more effectively with larger competitors like Accenture and IBM, which have massive offshore scale today. With this deal, HCL and CSC are betting that much of the spoils of all that new transformation activity will largely fall to those that conduct the initial work of modernization. With HfS estimates of around 80% of today’s enterprise application services spending directed at maintaining legacy systems, there is significant upside for the two firms if they can free up this spending for transformation. The enterprise application services market now faces a challenging new reality where yesterday’s mega multi-year deals have been replaced by more tightly defined projects. In response, IT services firms need to develop more targeted and nimbler ways to compete. This means tailoring industry specific offerings in order to win new deals. Which brings us to the heart of why it just might serve as the new go-to-market approach for many providers. By forging this alliance, CSC and HCL can collectively go after these narrower markets without making many additional investments that would destroy their ability to remain competitive. HfS’ expects to see this new partnership model utilized by many of the IT service providers seeking to compete across verticals where individually they need to plug scale and capability gaps. We are also highly likely to see more focused collaborations in specific business process areas where pure-play BPO providers could do more hook-ups with technology services firms which lack the process expertise and knowledge. Net-net, HfS believes that this partnership could serve as a highly-effective model for providers seeking to address the new emerging marketplace defined by deep industry knowledge coupled with vertically-focused technology platform solutions. Mega-acquisitions in IT services have become far, far too costly and unrealistic in today’s environment, and partnerships like this could signal the way forward for many ambitious service providers. Providers want to be more agile and focused, not so big and clunky they lose sight of their goals and control over the operational costs, which is why many of the mega-mergers in IT services have not yielded very successful outcomes in recent years. Here is another perspective that says history of such partnership usually helping one such partner ! @takraj: it's easy for people to dismiss / look for holes in these partnerships. End of the day you can only judge the intent and motives of the partnership upon announcement - and the mechanisms being put in place to give it a chance of working. Forget the cultural differences for now - they're partnering opportunistically as opposed to getting married.